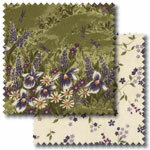 Pelenna Patchworks: Moda Lady Slipper Lodge range now in stock, plus colour coordinates fat quarter packs! Moda Lady Slipper Lodge range now in stock, plus colour coordinates fat quarter packs! Inspired by an early summer visit to a lodge surrounded by wildflowers, including hundreds of the majestic lady slippers, Lady Slipper Lodge is a gorgeous range of fabrics in purple, green and earthy brown tones, designed by Holly Taylor for Moda Fabrics. We have the whole range off the bolt, and several colour coordinated fat quarter packs and stash packs available, as well as a free pattern using the Lady Slipper Lodge range that we have put together in a quilt kit to make a gorgeous double bed quilt. Also new this week - our colour coordinated stash packs are so popular that we have just launched a new range of fat quarter packs in a similar style. Made up of prints from our basic and tonal ranges, the colour themed packs contain six fat quarters in red, yellow, pink, green, blue, brown and cream, purple and orange, and the rainbow pack contains seven fat quarters in all the colours of the rainbow. The default is fat quarters in the pack, but if you would prefer long quarters (if you are using strips, for example), there is the option to select long quarters in the packs. Perfect stash builders, you even get 5% off the total price of buying the quarters separately! 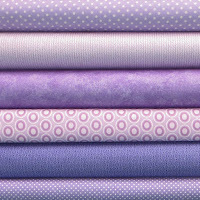 Moda Winterberry fabrics now in stock!